I love candles and I love Ikea. However, I never realized what a great deal Ikea’s tealight candles are. I spent $15 and I have enough candles for a month!! I use to buy the dollar candles at Dollar Tree and A.C. Moore but they burn out in a day. Plus I like to burn candles in the livingroom, diningroom, my room, and all 3 bathrooms. At $1 a candle that gets expensive. If you are a candle person check out Ikea. I just finished landscaping my backyard and fencing it in. Then to my surprise there are two gigantic holes in my landscaping (not happy). So I go to Lowes to get rid of the pest and she gives me a trap that requires me throwing the rat away. Ahh nope, not going to happen. I have moved out of places because I heard a mouse/rat. This rat and I can never meet. So I put peanut butter on rat bait and dropped it in his holes. I also bought some spray to put on my trash and around my fence to deter the rat. I learned that rats don’t like peppermint. Next I am going to learn a DIY peppermint spray to deter the rats. I am getting so tired of these combat sport participants running track during matches. Floyd Mayweather created this monster in boxing and now it has carried over into the UFC. I had almost given up on boxing after watching pay-per-view after pay-per-view of Floyd Mayweather running from opponent after opponent and getting a win each time. Now it has carried over into the UFC. I watched joanna jedrzejczyk run from Jessica Andrade and scared to engage. Out of her terrible performance she got the win and praises fromDana White. I have vowed that fighters who perform in this manner will never get my dollars for pay-per-views. Now today I got to see Alexander Gustafsson run (literally) around the cage from Glover Teixeira. Luckily he got the knockout but still a majority of the fight he was scared to engage. If these type of performances continue to not only be allowed but also praised, combat sports are in danger. Alcohol and cage fighters, a recipe for disaster. Well working through the TUF seasons. I was not impressed with TUF Season 2 and I feel like Rashad Evans has not reached his full potential. Michael Bisping is on TUF Season 3 and is the current champ for his weight class. I am hoping this season will be impressive, plus I am a Matt Hamil fan. I love the UFC and hope it doesn’t get commercialized like boxing but Conor McGregor is killing the sport for me. I love the last Saturday of the month. See where I live the Goodwill stores have 50% off sales the last Saturday of every month. This weekend I get a bonus because its Memorial Day as well. Now I use to go crazy on the last Saturday, but my closet got full of a lot of mismatched stuff that I couldn’t put together as an outfit. Now I shop with a plan and allow myself only $15-20 of off list purchases (you gotta feed that impulse buy need). Sometimes items are off list but a good buy. I will give you an example my Seinna Luna Plus Steam mop was $25 and off list. However, it retails at $109 (discounted). The reviews for this mop was off the chart and I really don’t like my Shark (which I got from a second hand store). I just like to remind people buying unnecessary, unusable, and unneeded items is not a deal. Happy shopping!!! 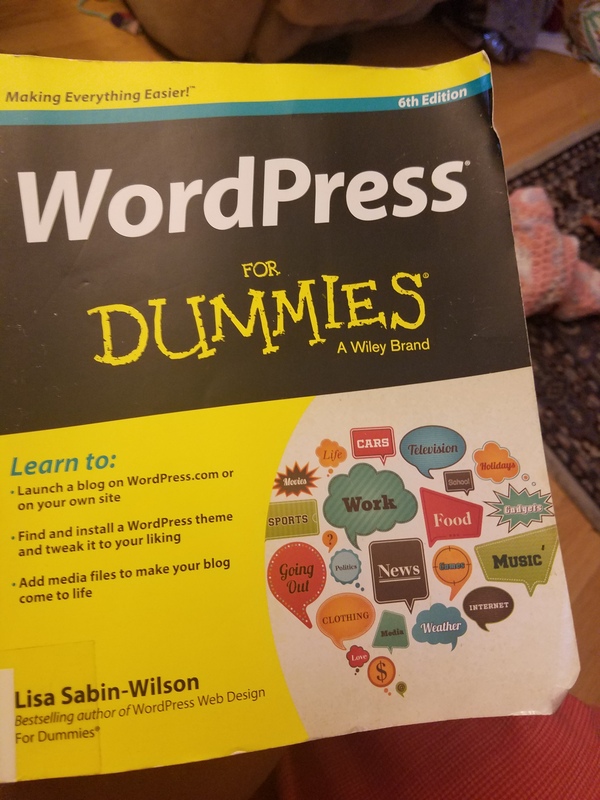 I feel like I am not reaching my full blogger potential, so I picked this book up. I know one major downfall is not blogging enough. So here goes, send me up some blogging prayers.